Here is a collection of Themes that will transform your website into a fully functional Coupon Website. Coupon websites are booming up everywhere because the amount of affiliate income you could generate from sales. Everyone loves coupons and a good deal so as soon as you create a coupon website you are bound to make money. With these themes you can create a website like Savings.com, UltimateDeals.com, Coupons.com, Redflagdeals.com, and more. Below is a collection of the best Coupon Templates you can find to create a successful Coupon Business Website. Cost to make your own daily deals website like Groupon.com or LivingSocial will be less than $100. I’ve listed the cost breakdown below. I recommend to use WordPress because it is the easiest way to create your own website. Wordpress is easy to install, easy to create new deals, easy to upload images, easy to instantly transform your WordPress blog into a daily deals site just by changing the WordPress Theme. Using Dealicious WordPress Theme is the best choice to create your online daily deals website. You can upload unlimited images of the product, see a countdown timer to the deal end date time, regular price, sale price, number of units sold, how much percentage the person will save, a big call to action button to ‘Buy Now’, blog integration, view past deals and more. This is a great WordPress Theme to create your own Groupon website. 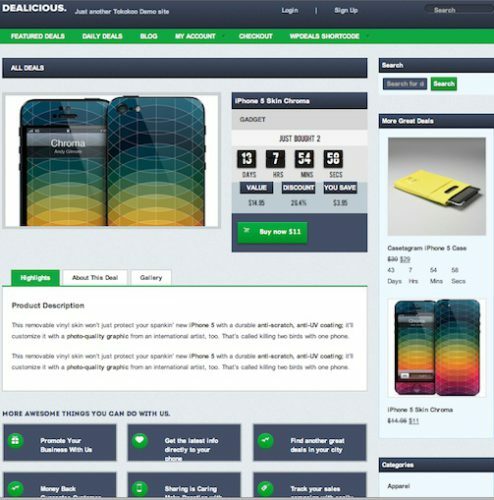 Click here to see more features of Dealicious. 1. $56 for Webhosting. To create your own Deals Website, you will first need a domain name. That’s why I recommend Fatcow.com. When you purchase web hosting from Fatcow, you get a free domain name. Along with that you also get unlimited email, disk space, bandwidth, MySQL databases, host unlimited domains and more. Click here to immediately save 40% off at Fatcow.com. 2. $0 for WordPress. WordPress is completely free open source platform. At Fatcow.com they have one click installs and you can literally have WordPress installed in minutes for free. 3. 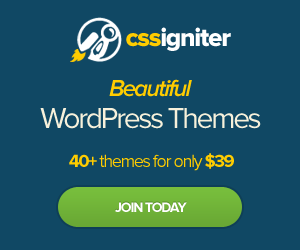 $99 for WordPress Theme. This is a one time fee to purchase Dealicious WordPress Theme from Tokokoo. After you download the theme, it totally belongs to you. There are no subscription fees, no membership fees and no hidden fees. 4. -$175 in Advertising Credits. If you purchase your webhosting from Fatcow.com you get free $175 worth of advertising credits. Fatcow.com understands it’s difficult to advertise your Daily Deals Site and so they give you free advertising credits, this includes $100 for Google Adwords, $50 Facebook ads, and $25 for Yahoo/Bing. So you actually don’t pay anything to startup your Deals Website. This is a great opportunity for you to use this Groupon Theme to create your deals website. It is packed full of features and the WP Deals plugin is already integrated into the theme. The WP Deals plugin has all the essential deal making website such as voucher management, order management, sales management, payment management, product management, customer management, merchant management, restock management and more. The theme is fully responsive so that means users using their smartphone or tablets can view your site with no problem. The content automatically wraps to fit the screen. You can demo that by resizing your window when you demo Dealicious. Overall this is a great WordPress Theme and I highly recommend Dealicious if you want to create a daily deals site like Groupon or Living Social. It’s finally out! The Clipper WordPress Theme by AppThemes is a premium coupon and deals template. I’ve been keeping my eye on this baby since I first saw it in their development path last year. This is an amazing theme full of functions, features and fully equipped to make a coupon website. See below, I’ve listed all the costs you need to incur to create your own coupon site. You can easily create a coupon website like savings.com, ultimatecoupons.com or any coupon savings website without any programming knowledge. Wordpress takes care of everything, you will have your website up in a day. This Coupon clone is packed full of features. I love the scrolling featured coupons and auto copying of the affiliate id when they try to copy the coupon code. Check out all the cool features in this Clipper Theme – here. 1. $56 for Webhosting. The first step you need to do is purchase a webhosting and domain name. I would recommend Fatcow.com because if you purchase webhosting from them you will get a free domain name. You will also get unlimited email addresses, unlimited disk space, unlimited bandwidth, unlimited MYSQL databases, host unlimited domains, 24×7 support, and many more. Reason why the cost is so low is because Fatcow.com is having a 40% off sale, so I don’t know how long this price will last. Click here for more details. 2. $0 for WordPress. WordPress is completely free. It’s an open source program and free to download at WordPress.org. If you use Fatcow.com you also get free WordPress one click installs. 4. -$175 for Advertisting Credits. Fatcow.com gives you free advertising credits to help you get traffic to your website. The free advertising credits include $100 Google Adwords credits, $50 Facebook ads credits and $25 Yahoo/Bing Ad credits. Once you build up your website you can also post your business on YP.com (Yellowpages) for free. This means that you don’t pay anything to startup your Coupon website with Clipper Coupon Template. Now I think that is a great deal. I highly recommend the Clipper theme by Appthemes. This is a great Coupon Management template will help you do the hard part of creating the website and you can focus on the easy part of adding coupons. Click here for webhosting details – Fatcow.com. Click here for more details about the Clipper Theme from AppThemes.